Agents can drop items or pick them up. This is currently the only way to transfer items between agents. To drop an item, tap the inventory status panel to go to your inventory, select an item to drop, then tap the “Drop” button at the lower-left. The object will appear on the ground in the scanner view at your current location. Other agents will be able to see it after a few moments. To pick up an item on the ground, get within 40 meters of it, then touch it and tap the “Acquire” button. The item will be added to your inventory. Dropped items can be picked up by any agent, including enemy agents. When transferring items to another agent, take care to ensure that enemy agents do not intercept them. Premium items (those which must be purchased from the store) cannot be dropped. A dropped item that is not picked up will disappear after approximately 30 minutes. This duration is usually temporarily reduced during anomaly events. You cannot drop multiple items at once. If you select multiple items in your inventory, you will only be allowed to recycle them, not drop them. Instead, load the items into a capsule, then drop the capsule. However, key capsules, being premium items, cannot be used for this purpose. You cannot pick up an item if doing so would put you over 2,000 items in your inventory. If more than one object is very close to the point you tapped on the scanner view, a “tap disambiguation” display will appear, showing up to six objects closest to the point you tapped. You can then tap the one you meant. Before 9 January 2013, items that were dropped would remain there indefinitely. This, combined with no ability to recycle items, resulted in ridiculous amounts of “litter” strewn around. On 6 May 2015, the “intention filter” was added to aid agents in selecting objects on the scanner that were too close to another object. 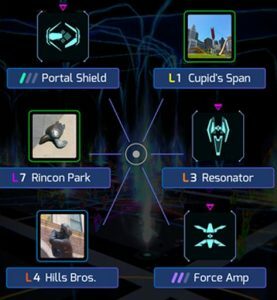 The intention filter was not included with the release of Ingress Prime on 5 November 2018. The functionality, now called the “tap disambiguation” display, was restored on 26 February 2019.